Flick Marty in the Face! You know what toy we’ve always wanted? 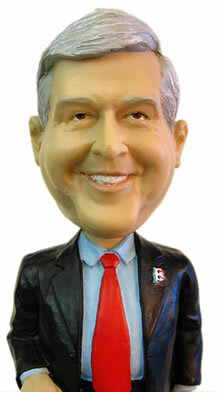 A Marty Markowitz bobblehead. Well, that’s not quite true; what we’ve really wanted was a talking Marty doll. (Pull the string and it’d say, “You’re leaving Brooklyn? Oy vey!” or “How about a nice slice of cheesecake?”) But a bobblehead is pretty damned cool, too. And according to a press release we received yesterday from the Brooklyn Cyclones, the team will be giving out Marty bobbleheads at their Sunday, August 5, game, against the Aberdeen Ironbirds. The first 2,500 fans to arrive will get one, and now we’re tempted to go. The bobblehead currently on our shelf is Noah, and he (of all people!) is feeling lonely.